Fair. Highlighting, writing in pages Item is intact, but may show shelf wear. Pages may include notes and highlighting. May or may not include supplemental or companion material. Access codes may or may not work. Connecting readers since 1972. Customer service is our top priority. Good. Ex-Library Soft cover with medium wear to book edges and cover. Library stamps and stickers are present. Fair. Cover and spine has heavy wear. Clean pages no writing or highlighting in book. Satisfaction Guaranteed. New. 'The best book of philosophy in years, ' says John Gardner. 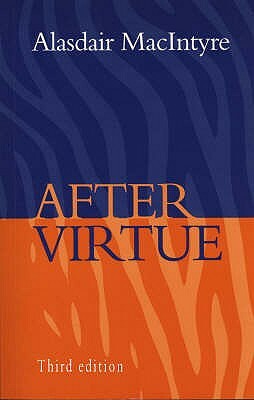 Since its publication in 1981, it has been impossible for moral philosophers to write about their subject without coming to terms with MacIntyre and his provocative critique of modernity. 286 pp. 1981, University of Notre Dame Press, Notre Dame, Ind. The kindest thing I can say about this book is that the writing is unduly prolix. I joined a bimonthly discussion group which had chosen this for its topic. In preparation for the third week of discussion I skipped ahead to the end of the third chapter to see what the conclusion was. I took me so long to even parse one or two of the sentences that I gave up and resigned from the group. I do not consider it my task to disentangle what the author said into what he actually meant. That is his job, not mine. I do not recommend its purchase.